There was a time where every family in Scotland would have had their own clootie dumpling recipe. But I guess home cooking went out of fashion in the last few decades and dumpling is now only found wrapped in tartan in Royal Mile gift shops. 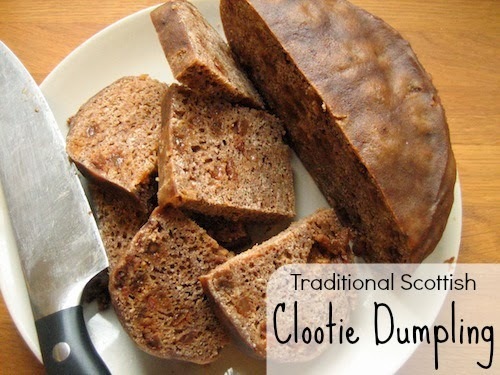 I only know of a few people who would still know how to make a clootie dumpling. This was the cake that we had for every birthday growing up. I usually make one for Small's birthday now, but she is also partial to a double-decker sponge with pink butter icing. Anyway, this is my family's recipe. It's an old recipe so the measurements are in old money... that's just the way I roll. Stick all the ingredients in a bowl and mix it well. The proper consistency is 'soft dropping' so add a dash more milk or flour if it needs it. Now for the complicated bit. My dumpling cloth is made from an old white cotton pillowcase and is at least 25 years old, after over 100 dumplings, it doesn't need floured: it is well seasoned. You then need a second cloth. Mine is 3' square cotton sheeting. A muslin square or even a tea-towel will do. This second cloth just stops the important cloth from sticking to the pot. Pour your dumpling mixture into the cloth. Using a second bowl here helps a lot. Now using a length of string tie the top of your cloth make sure it all closed up but with room for expansion. Wrap this parcel loosely in the second cloth. You need 9" or 23cm diameter pot. Put a plate on the bottom (to stop the cloth sticking) and then put 2 inches of water at the bottom of the pot get it boiling before adding the dumpling. Now lower your dumpling into the pot, put on the lid and reduce the heat to keep it just bubbling. The dumpling needs to boil for 1h 45min you mustn't let the pot boil dry, but you also mustn't put too much water in. The water should be just visible around the sides. When it is finished cooking you need to remove the dumpling from the hot water (using large tongs) and carefully remove it from it's cloths. The trick is to sit it on a plate, un-peel the top half from the cloths, place an upside down plate on top and flip it over. Remove the rest of the cloth slowly. Do not slice it like a normal cake, slice as you would a fruit loaf. It is very filling and will easily slice into 30 or more pieces. It keeps well for a few days, it also freezes well, but slice it first. Mmmm Love Clootie Dumpling, very nice to see it being made properly. I have a recipe for microwave dumpling, which takes ten mins and surprisingly tastes amazing...pity I don't have a microwave any longer though! This looks delicious, sounds like a similar flavour to a Welsh Bara Brith? Would probably be delicious with butter? It is delicious with butter! Yes Liz, dampen the cloth first so that the flour will stick to it.